General Characteristics: Resembles Mana Keokeo except that petioles are decidedly lighter green and leaf blades are sagittate rather than ovate. Petiole: 60 to 85 cm. long, light green, pinkish-red at edge, white at base. Leaf blade: 45 to 55 cm. long, 30 to 35 cm. wide, 35 to 40 cm. from tip to base of sinus, sagittate, medium green; margins undulate; piko light greenish; lobes acute with narrow sinus. Corm: Flesh white with yellowish fibers; skin whitish. 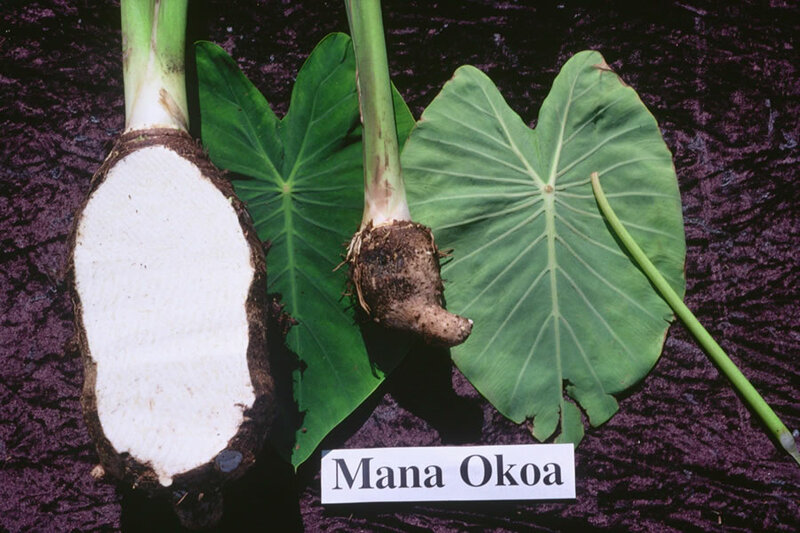 Origin, and derivation of name: Probably native of Hawaii; as no name could be ascertained it has been given the descriptive name of Okoa, meaning "another." Distribution: Limited; occurs as a mixture in large plantings of Mana Keokeo.